Atlantic City demonstrates how cross-sector coalitions built on trust are key to healthier communities. A new funding opportunity is seeking similar New Jersey coalitions that are tackling local priorities, especially in low-income communities. Atlantic City, New Jersey, is a colorful place with a storied past. Today, its casinos, beaches and boardwalk make it a natural tourist destination, with a transportation infrastructure that puts it within easy reach of millions of people. The many languages spoken in the city are a testament to its vibrant diversity. Despite its long-standing status as a tourist destination, the city has not always enjoyed a stellar reputation. Crime rates exceed national averages (although they’ve fallen over the past few years), and unemployment is nearly double the national rate. Gambling hasn’t brought much luck to a place that sits in a county ranked 17th in health outcomes among New Jersey’s 21 counties, according to 2017 County Health Rankings data. How New Jersey Health Initiatives is working with communities across the state to improve the health and well-being of all New Jersey residents. Yet Atlantic City does have a winner’s circle of passionate players who are deeply committed to turning their hometown around, growing its economy, and rebuilding its health. In 2015, New Jersey Health Initiatives (NJHI) awarded a fledgling coalition a four-year, $200,000 grant through AtlantiCare Foundation, an affiliate of the city’s largest health system. That coalition, Care AC, has been spawning new partnerships and an increasingly ambitious agenda ever since. NJHI’s grant to Care AC exemplifies our goal of using resources to bring together the right people, build trust, and foster productive conversations that all lead to a stronger, healthier community. As we pursue the Robert Wood Johnson Foundation’s vision for a Culture of Health, we think that cross-sector coalitions are a vital tool for changing systems, policies, and the environment. Care AC also recognized that assessing needs meant more than reviewing numbers. Or, as the coalition said in the Blue Print for Action that emerged from its year-long planning process, “statistics are great, but it is imperative to hear from agencies and community members—those with feet on the street.” So they surveyed more than three dozen civic and community organizations. Based on both data and grassroots insights, the coalition identified food insecurity, smart food choices, and physical activity as priorities for its second year. An early success was convening Atlantic City agencies to address hunger, which resulted in a comprehensive list of food-related resources, finding ways to secure more food donations, and creating a summer feeding program. Care AC later launched its Corner Store Initiative, where Care AC educators conducted BMI assessments, offered tips on smart shopping, and handed out healthy food vouchers. One shopper initially looked askance at her $5 voucher—until an educator guided her to purchases that allowed her to put a meal of pasta and salad on the table. The initiative is providing access to foods and encouraging healthier eating habits by expanding food selection in corner stores near schools, giving students access to healthier snacks. Another strategy was offering mini-grants of $500–$1,000 to small local agencies—with the catch that each one had to partner with another to be eligible for the award. We thought that was a terrific way to grow a network, while simultaneously improving the lives of residents. The Community Food Bank, for example, used its grant to launch a new food pantry at a family medicine clinic run by AtlantiCare. Grace and Glory, a yoga studio, partnered with the Boys & Girls Club of Atlantic City to provide summer yoga classes to school-age children. While Care AC’s visibility grew, another collaboration was getting underway—the Homeless Assessment Response Team (HART). HART was seating law enforcement, transit, tourism, and health and social services together to look comprehensively at the needs of the city’s homeless population. Some of the same partners were involved in both coalitions, recognized their overlapping challenges and goals, and started working together. This is the kind of collective commitment that improves health in the community. Folks who care about public safety, nutrition, business investment, or a city’s curb appeal may start from different places. But in Atlantic City, they all share a common interest in moving the homeless population out of the city’s parks and transit stations—into services and healthier living. Equally important, the coalitions are tackling shared problems upstream—where they work, play, live, and learn. They don’t want to see the homeless displaced out of town or overlook their civil rights. Instead, they agree that deeply rooted challenges too often lead the same individual to cycle through jails, the emergency department, substance use treatment centers, and social services—only to land back on the street. Care AC, now in its third year, and HART, as service providers, share an obligation to change that pattern. Streamlining and sharing data is essential to their collective efforts. The partners have agreed to ask a common set of questions when a vulnerable individual comes into any system. Eventually, they plan to enter that information into a shared database called the Homeless Information Management System so that everyone knows whether other clinical or social service providers have already been involved. Their goals are to enable more respectful handoffs, agree on a client’s priority needs, avoid resource-draining service duplication, and ultimately improve outcomes. There’s no sugar-coating the difficulty of these goals. Privacy issues always loom large. And shifting from a competitive mindset to a collaborative one doesn’t come naturally to many providers, who are understandably concerned about protecting their own business models. But the bet in Atlantic City is that joining forces will pay off in a resulting healthier community that will benefit everyone. Here at NJHI, we’re looking for more approaches like this. That’s why we’ve developed a new funding opportunity: Upstream Action Acceleration. We’re looking for existing coalitions in New Jersey that are already tackling local priorities, especially in low-income communities, but are ready to start earlier, and go further. We want to hear from folks who share our expansive view of health, which recognizes the many influences rooted in where we live, work, play, and learn. If you can work from the ground up, not just the top down, and have creative ideas for changing the policies, systems and environment that impact health in your community, please consider applying. Be sure you are setting a big table, because many sectors need to be represented, and many voices must be heard. 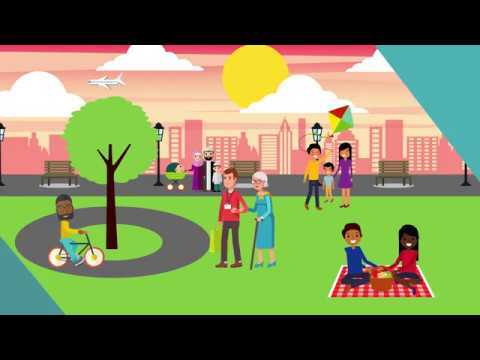 Learn more about what we’re doing to help our home state of New Jersey become a healthier place to live, work and play. Bob Atkins is director of NJHI and an Associate Professor at Rutgers University with a joint appointment in Nursing and Childhood Studies. Bob is a lifelong New Jersey resident and is committed to building healthier communities across the state through effective collaborations and partnerships, meaningful conversations across sectors, and evidence-based innovations. Read his bio. Diane Hagerman, Deputy Director of Programs, oversees NJHI’s communications functions while working directly with grantees to ensure they are able to realize the full potential of their projects. Read her bio.